Luosto is nestled amongst the rolling hills of the Phyä-Luosto National Park, just 90 minutes from Rovaniemi Airport. This idyllic unspoilt resort is Finnish Lapland in a nutshell. Enjoy amazing views, clear Arctic skies and a snowclad landscape that extends beyond the horizon as you head to the hills by snowshoe, snowmobile or snowcat, whereas frozen forests are criss-crossed by a maze of husky trails, reindeer roads and cross-country ski tracks. There is even an Amethyst mine to explore and seven ski-slopes nearby. Our recommended properties include a resort hotel, complete with pool. An intimate, family run property and what has to be the best equipped glass igloos in Lapland. Depending on your choice of airline and airport, there is the opportunity to fly direct to Rovaniemi. 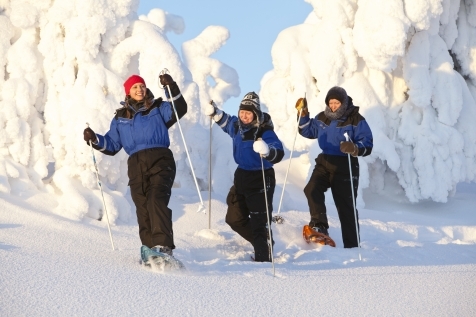 On arrival, leave behind the commercial heartland of Finnish Lapland and head to Luosto by airport shuttle bus, just 90 minutes away. Luosto is an idyllic village located in the heart of the Phyä-Luosto National Park. Check-in to your chosen hotel, familiarise yourself with your surroundings. Enjoy an early dinner before the first foray into the Arctic surroundings and an exciting hunt for the Northern Lights. We have included a Search for the Northern Lights by Snowshoe excursion. This easy to master art allows you to head with your guide into the unspoilt country-side to find the best spot from where, if conditions are right, you can view the Northern Lights. It is a delightful introduction to the region, best suited for adults and children over 12, so if this does not suit your agenda, we can look at alternative options for you. Supplements may apply. Luosto provides so many opportunities for excursions. We have picked our favourites and listed them on the opposite page, which then enables you to choose the activities that tick your bucket list. Select from snowmobile safaris, reindeer encounters and thrilling husky rides. Take the ‘snow train’ to the Amethyst mine for incredible views and the chance to unearth your lucky stone or enjoy the simple arctic past-times of cross-country skiing and snowshoeing. In the evenings you can just enjoy dinner and relax or head out in search of the Northern Lights. There is always the option of the nearby ski-slopes too with seven runs and a sledging hill. Don’t forget the option of upgrading to an Arctic View Glass Igloo for a night. Enjoy an early breakfast, check-out with your suitcase of memories, before taking the airport shuttle bus back to Rovaniemi in time for your return flight home. This small intimate hotel prides itself on its personal service and cosy atmosphere. Located an easy 10 minute walk from the village centre, it offers a quiet respite after a day packed with excursions and activities. The 25 rooms all have their own sauna, TV, tea and coffee facilities and aurora alarm. Many have their own fireplace and seating area. The restaurant serves breakfast and dinner with the chef preparing a 3-course table d’hote menu each evening, as well a choice of a la carte dishes. The hotel lobby and bar offers the opportunity to enjoy an aperitif. The relaxed atmosphere soon makes this feel like a home from home. 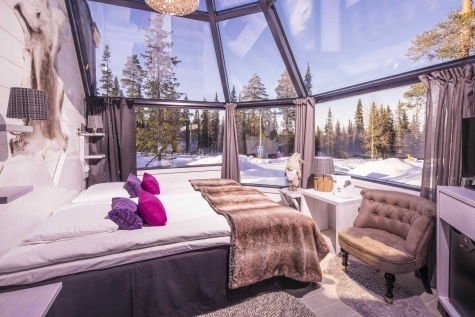 Santa’s Hotel Aurora has dedicated an area of their grounds to what has to be, in our opinion, some of the most luxurious glass igloos in Finland. The Arctic View Glass Igloos have panoramic glass windows for walls and ceiling, allowing a 360 degree view of the Arctic skies and surrounding nature. The Arctic View Glass Igloos are fully heated and decorated in typical Scandi-style, using throws and rugs to create an inviting ambience. Each Arctic Glass Igloo has its own en suite bathroom, shower and WC, a luggage storage area, flat screen TV, comfortable double beds and modesty curtains. Breakfast and dinner are taken at the Santa’s Hotel Aurora restaurant. Choose to upgrade for one night or even your whole stay, as unlike many other glass igloos these are designed for more than just a one night novelty sleep. The Lapland Hotel Luostotunturi is one of the biggest hotels that we offer in Finnish Lapland, with over 170 rooms and eighty 1,2 and 3 bedroomed apartments. Perfectly situated in the heart of the village, the hotel is a popular focal point. It is a popular choice for those wanting to utilise the indoor pool, spa, gym, lively bar, nightclub and busy restaurant, as well as being able to choose from a wide range of accommodation, including log cabins accommodating 4-6 people. All rooms are en suite, with flat screen TV’s, tea/coffee making facilities, with most having a balcony or terrace. This property is ideal for couples and families looking for a property where there is always something happening. After being taught the logistics of driving a snowmobile, head out onto one of the many snowmobile tracks that surround Luosto. Driving in pairs (there is ample opportunity to swop), travel through the snow-clad surrounds to a local reindeer farm. Here you will meet the owner, who has carefully selected the reindeer specially trained to pull the sledge. Enjoy a taste of this traditional and leisurely way of travelling, before returning to the farm for a hot drink before mounting the snowmobiles for the return drive to Luosto. 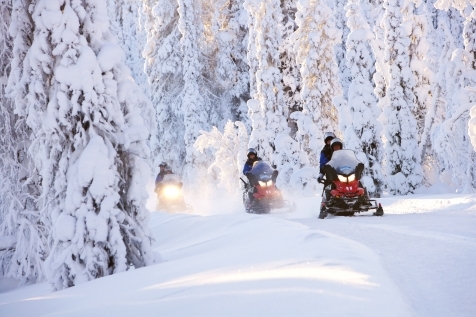 Combine a snowmobile safari and a thrilling 10km husky mushing trip in one. You will receive full instruction as to how to handle the snowmobile and a lesson in husky mushing, as you explore the trails and tracks of the snowy forest – first by machine, then with some four-legged friends. Contrast the roar of the snowmobile with the silent panting of the dogs as they make their way through the Arctic country-side. You will drive in pairs, with ample opportunity to swop driving duties should you wish. 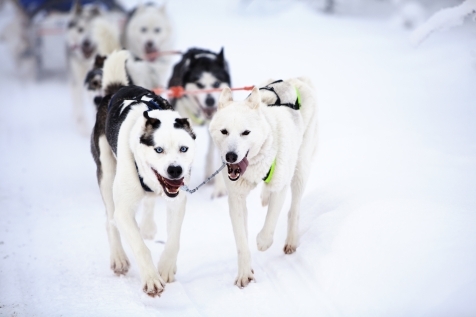 Enjoy a 10km husky taster session, where you will learn how to mush a team of huskies, before following the forest trails with your own team of dogs. First, transfer by mini-bus to a local husky ranch. On arrival you will be greeted by a cacophony of noise. The eager dogs are all barking with anticipation of their morning run. Driving in pairs, there is ample time to enjoy the serene and surreal Arctic surrounds or take a turn at mushing. On returning to the ranch, enjoy a hot drink and a chat with the head musher about his incredible job. Spend the afternoon in the company of these remarkable working dogs, who just love to run. Transfer by mini-bus to a local husky farm, where you are greeted by the howling dogs, all eager for their afternoon run. Receive full instruction on how to ‘mush’ the dogs and control the sled, then embark on a 20km thrilling safari through snow-clad forests and across frozen lakes. Coffee and snacks will be served in a Lappish Kota with open fire, before your return ‘mush’ with your team of dogs. Transfer by mini-bus to a nearby reindeer farm and enjoy a memorable reindeer sleigh ride. This form of travel has been used by the local Sami for hundreds of years and is an unhurried and relaxing way to travel. Snuggled under thick blankets, the reindeer train travels through the Arctic landscape at a gentle pace and there is time to appreciate the surrounding silence. Returning to the farm, you will be served hot coffee and a bun served around a roaring campfire and be able to learn about the life of a reindeer herder past and present.